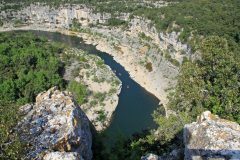 The spectacularly beautiful Gorges de l’Ardèche is a very popular destination in France for canoeists and nature lovers. 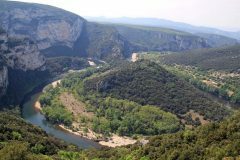 The Ardeche Gorge is one of the most beautiful natural landscapes in Europe and can be enjoyed for free by all. 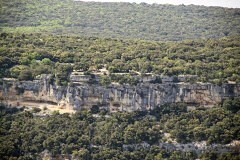 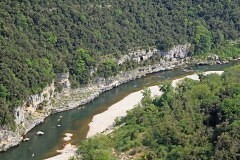 The Gorges de l’Ardèche is a France Michelin Guide three-star sight and one of the most beautiful landscapes in France. 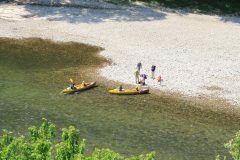 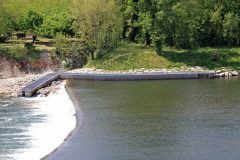 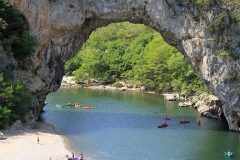 The Ardèche Valley is hugely popular for canoeing or kayaking and hiking but the less athletic can also enjoy the beautiful panoramas and vistas from the comfort of a car. 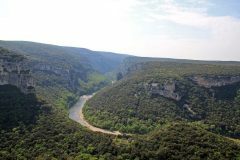 Numerous viewing platforms allow drivers to pull off the road to safely enjoy the views of the meandering Ardèche River. 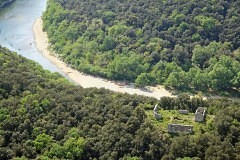 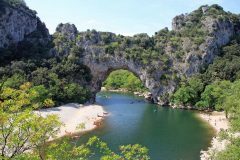 The Pont d’Arc is a natural rock bridge over the Ardèche River and a popular destination with beach. 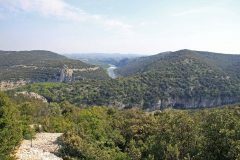 The most beautiful part of the Ardèche Valley is the gorge that can be enjoyed on the drive from Vallon Pont d’Arc to St Martin de l’Ardèche. 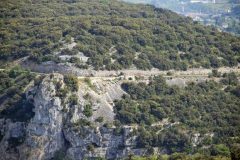 The distance is only around 40 km but expect the drive to take at least an hour, excluding any stopping time. 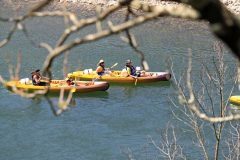 (By canoe, plan on around seven hours – camping is possible en route.) 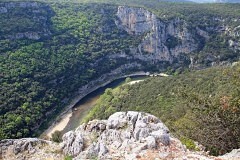 This tourist route is very well maintained with several safe viewing platforms. 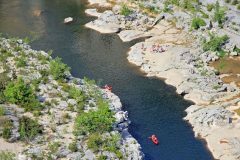 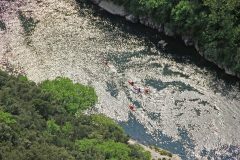 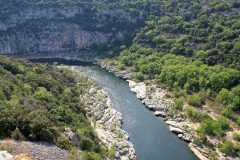 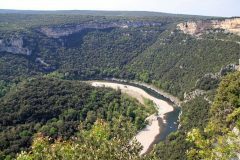 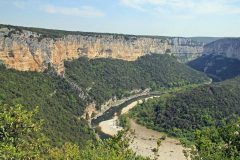 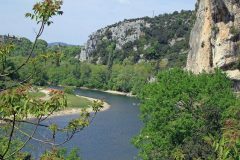 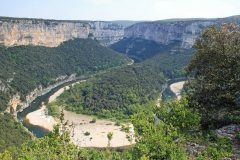 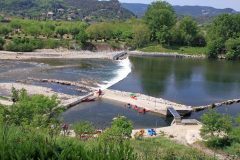 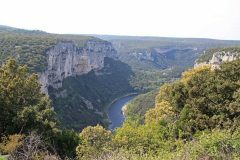 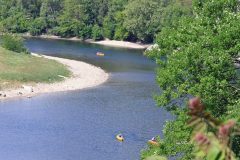 The route through the Ardèche Valley follows mostly the high ground with spectacular views of the river, canoeists, and the dramatic scenery. 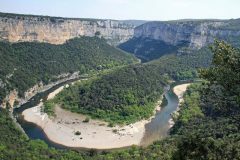 Like canoeing, the drive through the Ardèche Gorge is best done down river (Vallon Pont d’Arc towards St Martin and the Rhone River) to ensure easy access to most viewing platforms and parking lots. 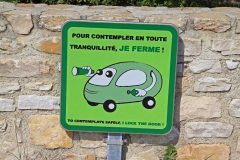 However, going in the reverse direction should not be too problematic, except perhaps on busy weekends and during the summer vacation period. 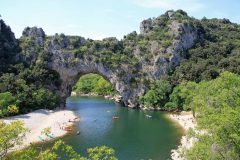 Minibus tours is also possible to arrange from Lyon, Avignon, and other destinations in Provence while many companies offer canoeing with return transportation. 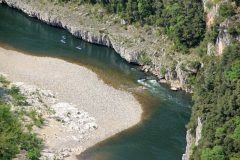 The photos below were taken in the Gorges de l’Ardèche during the school vacation period a few days before Easter – parking was freely available at all viewing platforms and some were even deserted mid-afternoon. 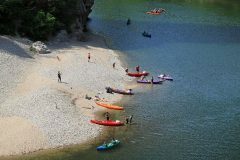 On weekends, and during all of July and August, the gorge is much busier. 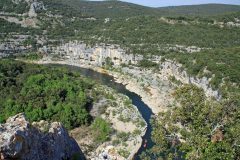 The nearby Aven d’Orgnac Cave is another Michelin three-star sight and easily combines with a visit to the Ardèche Gorge. 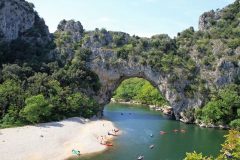 (Several further –and heavily promoted – caves are in the Ardèche Valley itself but the Orgnac Cavern is the best one to see in the area.) 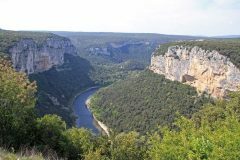 The beautiful region is worth a journey but also works in well as a stop en route to the south of France and a short drive from many parts of Provence.